Earlier on, we had highlighted the basic reasons why no one should underrate the beauty of picture frames in interior decorations, but wall art doesn’t end there, it goes way deeper than just being applied after the paints on the walls are totally dried up. Just as we made it clear that interior design lovers should quit looking down on picture frames, this post is also an eye opener which should help you see the amazing opportunities you could be missing out, but just deciding to ignore the elegance that a wall art can provide to the interiors of your home. For those of our readers who are still feeling skeptical towards giving wall art a chance in their interior’s plans, this post will serve as a simple guide, to get you informed on the many benefits that a wall art can offer. Of course we cannot fail to agree that every room needs a focal point. If the focal point of your home doesn’t stand out, then you should already know by now that a wall art can serve perfectly towards drawing every eye into the space it graces, holding everyone ransom and unable to take their eyes off. 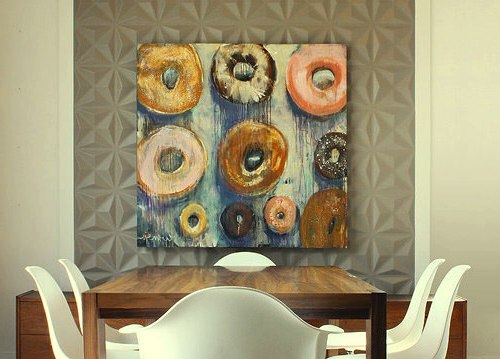 One of the major determinants of choosing the best wall art to serve at the focal point of your home is the size. If you don’t have the best size that fits the wall perfectly then you may just have a ridiculous image which will go unnoticed if it is too small, or become an overspill if it is too big for the space. Borrowing a quote from George Orwell’s animal farm, all wall arts are equal, but some are more equal than others. Some wall arts are crafted to take two or three dimensional forms, it is your duty to look out for the best wall art that will give off a sense of texture to the space it occupies, creating a perfect blend tone with the paint shade. Nature abhors vacuums, interior decorators find the right element that fits the puzzle of an empty wall to make it complete. Wall arts offer an extra touch with an awesome framework that makes everything feel like home. Be sure to choose a wall art with a story that will match that of your home’s design theme and style, remember the wall art will be something that you will be looking at for a very long time, make the decision, but don’t be in a hurry to make the choice.